Midwest Energy and Communications (MEC), our Internet Service Provider, will begin posting monthly construction updates on their website as well as emailing these updates to everyone who has subscribed to the broadband service. The first of these updates is included below. We will post these updates here as well and continue to post other information that may become available during the month. 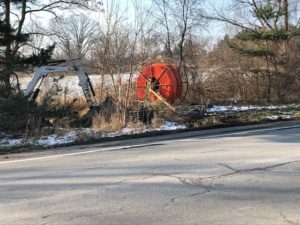 After a lot of hard work evaluating and awarding bids, and working with many state and local agencies for permits, Lyndon Township began construction for the high-speed fiber internet project. In fact, folks on Stoney Ridge Road and Greystone Drive already are seeing crews install conduit for the fiber. Those crews soon will move to Wildflower Ridge, Bens Drive, and Coopersfield Road. Mother Nature is really in control as we move forward. With a mild winter, construction can continue uninterrupted, and we can begin home installations in the southeast part of the township by spring. Keeping to that schedule, we’ll have all interested subscribers hooked up by the end of 2019. It’s hard to be patient when you’ve waited so long for a high-speed solution, but the process is now underway and we promise it will be worth the wait. If you have friends, family or neighbors within the township who have not yet signed up, please encourage them to visit www.teammidwest.com/lyndon before April 30 to take advantage of the free installation. Work has begun on M-52 to bring Middle Mile Fiber to Lyndon Township. Middle mile fiber is that section of fiber that connects a network (Lyndon) to the greater world of the internet. Here is that work in pictures. The Chelsea School District, Midwest Energy and Communications and Lyndon Township have formed a creative and mutually beneficial partnership that will help move the Lyndon Broadband Project forward. Eead more about the partnership. Staking to continue on private roads. Staking and construction may be experience temporary delays due to unforeseen conditions. Beginning the week of November 12, Henkels and McCoy will begin construction on the private roads that have been staked in the Werkner Zone (Stoney Ridge Road) and Island Lake Zone (Beede Drive, South Drive). 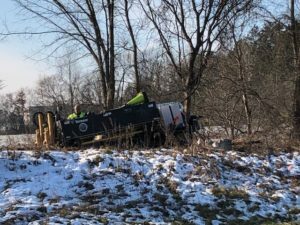 It is important to be aware that construction crews will now be actively working on the Township public and private roadways. We encourage everyone to exercise caution while driving on our roadways. In addition, it is also important to remember that these construction sites are subject to strict safety regulations that require safety vest, hard hat and safety glasses for anyone on site. On Monday, November 12, drilling will begin along M-52 to bring the main line fiber to Lyndon Township. The drilling will take place along a one mile stretch south of the roundabout at Werkner Road. The fiber will enter Lyndon Township on Werkner Road just east of M-52. 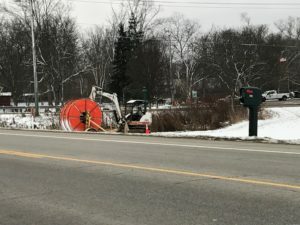 Later this month drilling will commence from that location to complete the main line fiber connection to the Lyndon Township Hall via Werkner Road, Island Lake Road and North Territorial Road. At the same time, work will begin on building out fiber lines in Werkner and Island Lake zones. The schedule for the remaining zones is contingent on the completion of the permitting processes. As this permitting is completed, additional scheduling information will be made available. It is important to be aware that construction crews will now be actively working on the township public and private roadways. We encourage everyone to exercise caution while driving on our roadways. In addition, it is important to remember that these construction sites are subject to strict safety regulations that require safety vest, hard hat and safety glasses for anyone on site.